Teachers, learn how to bring your class online through an introduction to Google Drive and Docs in this one-day workshop. Participants will experience the writing process, from drafting and editing straight through to publishing. We will provide an overview of these Google applications, explore best practices for implementing online writing in your classes, and provide instruction on drafting, editing, revising and sharing writing through hands on learning. 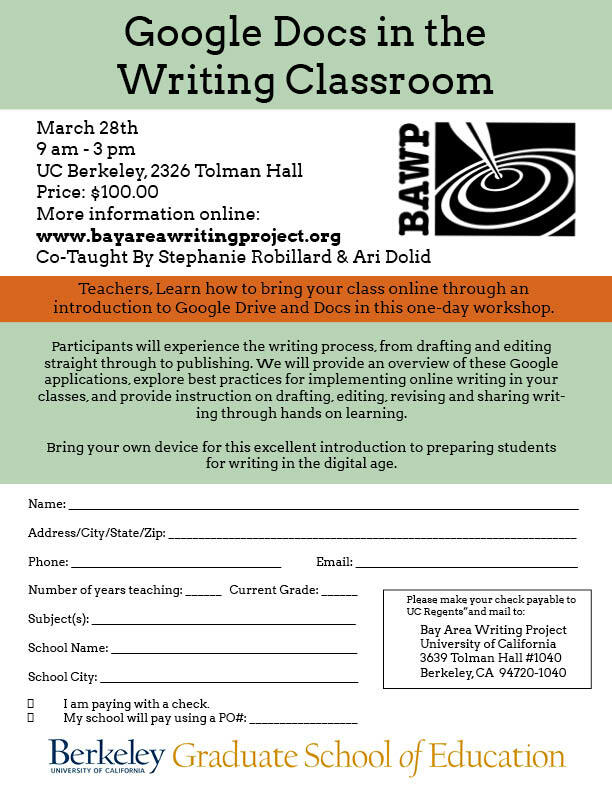 Bring your own device for this excellent introduction to preparing students for writing in the digital age. To register click here. Or, to mail in registration and check, fill out form below and follow instructions. By joellekristen in Continuity Programs on February 18, 2015 .